Ampfutbol Szczecin is hosting a football competition between people with physical disabilities such as for players with amputations and limb defects and men and women without disabilities. The tournament aims to send out a message of inclusiveness demonstrating to the public that football is not only a sport for young men, but a sport for everyone, regardless of age, gender or physical ability. The competition is led by professional referees from the Polish Football Association. In addition, Ampfutbol Szczecin are organising a seminar about women’s football and Ampfutbol. The Polish group is organising a 6-a-side tournament for teams, who are not organised in the official league system and consist of up to 10 players. ASPN Viking are aiming to tackle discrimination of all kinds during the Footbal People event. To reach their goal, the group is distributing informational material during the tournament to make all players aware of discriminatory problems and incidents. The Polish foundation is hosting a football tournament for 60 children and adults. A series of workshops will be organised as part of the activity, which will include participants from different walks of life, including asylum seekers, homeless and disabled. Dom Pokoju are organising the sixth Play Fair event during the 2015 #FootballPeople action weeks. It consists of several football matches of people belonging to various minorities and several NGOs. The main goal is to promote the involvement in anti-racist actions and sports itself. GAN will promote anti-racist behavior among supporters and the general public. The organisation will convey this message by displaying an exhibition themed Football Fans Against Racism at the local culture centre. A football tournament against racism will take place and a rock concert under the motto ‘Let’s Kick Racism out of the Stadiums’ together with educational workshops for supporters and students at a local school and film screenings as well as anti-racist presentations in a local music club will be organised and coordinated by the group. The association is organising their 12th annual anti-racist football match.The charity match will see ethnic minority players, TV and radio celebrities playing together to promote the message of social inclusion and respect. Kontra are hosting the third anti-discrimination football tournament under the slogan No to Racism. Participants include foreign students from the city’s universities who will play in mixed gender teams. The event aims at further integration of different minorities into sports in Lodz, as well as creating a space for the increasing number of female footballers in Poland. The activists will take pictures and distribute flyers with the message “no to discrimination” and an encouragement for women to play football on the city’s main street. 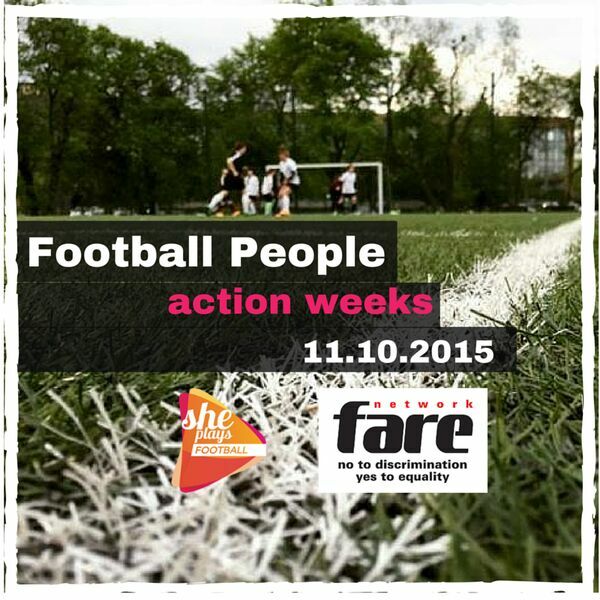 Klub Sportowy Orliczek are taking part in the #FootballPeople action weeks for the fifth time. The group will invite ethnic minority players and people with disabilities to play with them in an all inclusive tournament. KS Siemiątkowo’s will be putting an antiracist exhibition on display. The club is also hosting a match for two age groups followed by a lecture and the award ceremony. The aim is to involve as many residents of Siemiątkowo as possible and to educate children as well as adults about discrimination in sports. “She plays sp. z o.o.” are organising an amateur football league for women. The opening ceremony of the league and the first round are taking part during #footballpeople action weeks on 11 October. The league is dedicated to amateur women football playersand is the first ameteur women’s football league in Poland. The organisers are aiming to promote women’s football, the empowerment of women and the fight against the discrimination of women in sports. All women are welcomed to join the games. Stowarzyszenie GTW are organising a football tournament with different ethnic minority football groups for kids.The main goal of the group’s action is to get in touch with kids who just started playing football and to sensitize these for racism. The school from Wrzosowa is organising a meeting with students and teachers from other schools, especially those where Romanian children are taught. The Interschool Football Tournament will take place under the slogan: “We are all the same, equal and we don’t want to be discriminated”. All classes of the school will design their own outfits and banners to become supporters to represent and cheer on the country they have been given beforehand. The school from Kościelec, Poland, is painting murals of the former football star Didier Drogba on 14 October to use his story as an example and him as a role model to raise awareness of racism. On 16 October the school is hosting a football tournament for girls aged 13 – 15. The event will seek to fight discrimination of any kind, nationalism as well as the far right and is promoting the empowerment of girls in society and football.